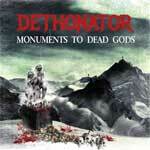 Dethonator are a heavy metal band from the UK formed in 2002, releasing their self titled debut album in 2010 and their second album 'Return To Damnation' in 2013. 'Monuments To Dead Gods' E.P. was released in 2014. Their debut album was remixed and partially re-recorded by the current line-up and released in 2016. 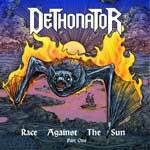 'Race Against The Sun' is a 2019 release, and is part one of a double album release, with the details surrounding the release of part two, coming later this year. ...a game that is only half way through, as the album progresses into its second half with acoustic guitars and a soulful vocal performance, only for about thirty seconds though, 'The Hangman' turning into one of the heaviest foot stomps this side of Megadeth. Riffs that sound like a catfight between a jackhammer and a chainsaw resonate through the airways with immense force. Such a savage barrage of brutality that will leave battered souls in its wake. Intensity levels shoot through the roof with the thundering 'Narcisside', mixing clean vocals with growled, and the traditional sound of heavy metal is spliced with blistering speed metal riffing. Riffing that becomes thrash metal styled as the fierce 'Terror By Night' crashes into view, demolishing anything and everything in its way. An upfront, in your face, arrogant swagger of savagery, the growled vocals are delivered with extreme aggression and may just scare a few people. Bringing the curtain down on part one, remember that this is the first of a double album release, is the fiery and fast paced foot on the monitor styled 'Sharps Cairn'. The instantly recognisable buzz guitar sound of the NWOBHM evolution stands tall and proud, 'Sharps Cairn' rampaging forth, triumphantly ending the album in glorious style. Overall, a thundering romp of grandiose heavy metal, blending the traditional classic sound with thrash to deliver a head bangingly addictive adrenaline rush.